The commander of Iran’s Revolutionary Guards admits that the main threat on his country is the “soft war” being waged against it. The commander of Iran’s Revolutionary Guards, Mohammad Ali Jafari, admitted on Friday that the main threat to his country is the “soft war” being waged against it. Jafari did not clarify exactly what he meant, but soft war is a term which usually describes steps such as sanctions, cyber warfare and espionage activities. 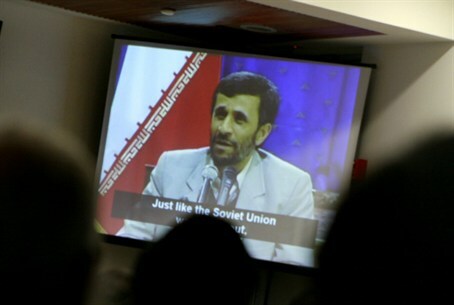 In addition to the sanctions that have been imposed on the Islamic Republic, its computer systems have been hit by several viruses, and some of its nuclear scientists have been assassinated. “Iran is in a sensitive and critical period,” said Jafari, adding that as such, the Revolutionary Guards must defend the country and its citizens from the actions of enemy countries that seek to harm Iran using such “soft” means. On Wednesday, the United States Congress passed a new package of sanctions against Iran. The sanctions aim to punish banks, insurance companies and shippers that help Tehran sell its oil. A day earlier, President Barack Obama announced U.S. sanctions against foreign banks that help Iran sell its oil, specifically citing China's Bank of Kunlun and an Iraqi bank. At the same time, there are ongoing rumors that Israel is planning to strike Iran’s nuclear facilities. Former Mossad chief Efraim Halevy indicated on Thursday that Israel is likely to strike Iran’s nuclear facilities in a matter of weeks. “If I were an Iranian, I would be very fearful of the next 12 weeks,” he told the New York Times.